Last year, I left BlogHer ’13 feeling like a loser. In fact, I wrote a blog post about it. But I must admit that after that post was featured on BlogHer.com and was one of the site’s most popular posts, I certainly felt I was #winning. In a couple weeks I’m heading to San Jose for BlogHer ’14. I’m determined to leave this year’s conference feeling on top of the world. To make that happen I must do some things differently and I think any BlogHer newbies should consider following my lead. Don’t compare yourself to others. I left BlogHer ’13 feeling like a loser because I was surrounded by women bloggers who had landed major sponsorships and book deals through their blogs and women who complained about having "a paltry 5,000 Twitter followers." I spent my 48 hours at BlogHer comparing myself to these women instead of focusing on my own mission, plans, and goals. Check out the Writeous Babe logo I designed for my new business cards. Don’t forget your business cards. Last year I ordered new business cards just for the conference and I left all 50 of them sitting right on my nightstand. So if you are heading to BlogHer ’14, go put your business cards in your suitcase right now. They will especially come in handy during Friday morning’s BlogHer Style Speed Dating. Don’t forget to party. Last year I didn’t wholeheartedly participate in conference activities. I was in Chicago not only for BlogHer but also to visit a friend. I often skipped the parties so that I could head back to my friend's place. While I don’t regret this because my friend and I had a blast, this year I’m staying in one of the official hotels and I plan to hit every party. Sure, this conference is about advancing my writing career, but it’s also about having fun! Don’t arrive without a plan. Before heading to the Silicon Valley, figure out what you want to get out of this conference and use this to determine what sessions you will attend. Knowing your overall objective for the conference can also keep you from getting caught up in the comparison game. With a solid conference plan, you will know your path and you can stay in your lane. My goal is to figure out what’s the next step for my blog and who I want to be in the blogosphere. Don’t leave without a plan, either. I am a teacher and I am a nerd so when I attend a conference I leave with pages and pages of notes. Then I come home, put my journal on my bookshelf and leave it there to collect dust. Not this year. In addition to taking notes, I plan to draft an action plan, too. I will compile a list of steps I will take based on what I learn on each session and give myself deadlines by which to complete them. Kavitha and I reunited two months ago in Birmingham! Don’t be shy. Whether you’re going to BlogHer alone, with your best friend, or with a group of blogging buddies from your hometown, be sure to use this conference as a chance to meet someone new. This is the one thing I did right last year. I met the wonderful woman behind the blog Kavi360 and we still keep in touch today. At BlogHer don’t look at the women around you simply as potential followers, see them as potential friends. 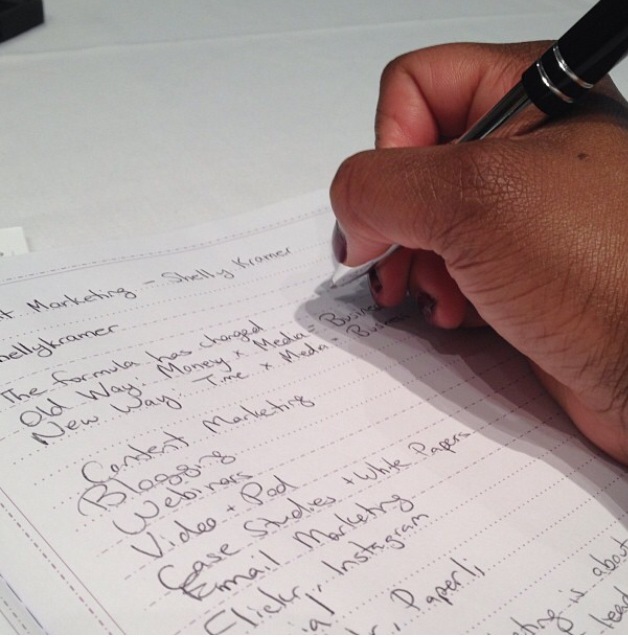 What are your tips for making the most of a blogging conference? Thanks for this! I remembered your post from last year about BlogHer and came to your blog to read it as I prep for next week. Glad I also found this gem. I'm definitely nervous to attend for the first time by myself, but I think it will be a great experience!